Successfully Added Elegance Dual SIM Quadband Cell Phone w/ 3 Inch Touchscreen to your Shopping Cart. Elegance Dual SIM Quadband Cell Phone w/ 3 Inch Touchscreen. A truly exceptional quadband GSM phone with flawless styling and superb functionality. This is a highly desirable mobile phone presented in piano black with a beautiful chrome finish for maximum appeal. Coming in a stunning, compact form factor, this is an uncompromising modern phone designed for the digital age. Fully unlocked to work on any GSM network, this dual SIM mobilephone provides you with quadband functionality (850MHz, 900MHz, 1800MHz, 1900MHz) and is ready for worldwide use. The two SIM card slots mean you will never miss that important business or personal call when you are driving around town or traveling across the world. With the CVFD-M31, a world of digital entertainment is at your fingertips. 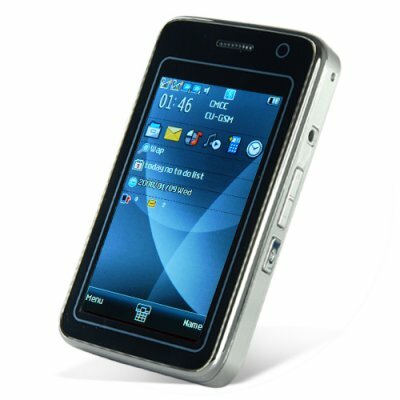 With a spacious 3.0 inch color touchscreen, this cellphone provides you with an unforgettable experience for the senses. Enjoy the full range of a rich digital multimedia provided by the digital camera to capture every perfect moment, the video and audio (MP3 and MP4) media players for all your entertainment needs, and a whole host of other digital media features. A sleek and intuitive touchscreen interface and accelerometer feature place you in total control of this mobile phone. Designed for those who work hard and play hard, this phone also comes with powerful productivity tools to organize your work, maximize your productivity and keep on top of your busy lifestyle. With a modern phonebook and contact manager, stay on top of your social and work life in today's busy world. The CVFD-M31 Elegance Dual SIM Quadband Cell Phone w/ 3 Inch Touchscreen is proudly brought to you by Chinavasion Electronics. This fashionable and attractive cellphone would also be the perfect gift for everyone you know who appreciates great design as well as just a profitable resale item. Order your stock now and don't forget that buying in bulk will save you even more on the unit price and shipping cost. NOTE: (1) This product is compatible with GSM at the four frequencies of 850MHz, 900MHz, 1800MHz, 1900MHz. This can be used throughout the world. (2) The second SIM card slot will not register properly with your carrier if you live in Brazil, Ireland, Sweden or the Netherlands. Both SIM card slots will work fine in all other countries in the world. But if you live in these two particular regions we suggest you choose another mobile phone model with dual SIM card slots. Click here to view frequencies for all major worldwide cell phone networks. Languages: English, Vietnamese, French, Spanish, Portuguese, Turkish, Arabic, and Thai. Does this quadband dual SIM unlocked cell phone come with a TV tuner as well? No, the cell phone does not come with a TV tuner. What is the operating system of this cellphone? The cellphone uses proprietary software for its Operating System. i´m very satisfield with the cell phone, i received it in 2010/09/21 and that won´t be the last purchase. soon i will be doing another bussiness.. See you!!!!!!!!!!!!! pluses: price, build quality, enough good usability, many abilities for charging (usb, charger, also can use standart nokia charger). Very stylish and durable phone - well more than what I expected for the price. Speaker quality wasn't fantastic, but its fine, and thats wasn't much of a problem. Very good product, way to go Chinavasion!